I met her few days ago when I went to buy fish, I always choose to buy things from these types of old people because I think this is the way I can help them. These types of people possess great self respect and this is the reason they try their level best to earn money by doing works not by begging. She got married at the age of thirteen and became widow at the age of fourteen, after that she has struggled a lot for both ends meet, she has worked in the fields and has cut paddies, she has cut wood and sold it, she has worked as maid servant. 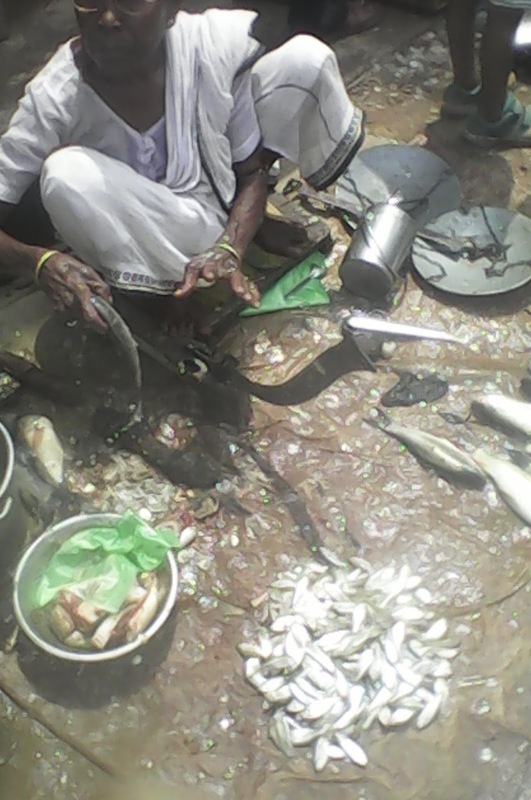 Now from last 15 years she is selling fish. I asked where she lives now. She informed that a whole seller of fish has allotted her a room in his home and there she is living for past few years. She was talking with me and was making my fish ready, that time a middle aged person came there and asked about the price of a fish, she became surprised for such an idiotic question and said---How can tell you the price until I weigh the fish? ---do you talk like this with your mother? May be I am bad and ungentle but I shared here what I felt when he talked so rudely, I can’t understand the simple thing is why these type of people don’t understand that---he is coming from home after taking tea and with a lazy walk, it was a hot day, he is coming after taking a sound sleep and delicious breakfast(all these I came to know after talking to him, I talked with him intentionally)and here this old woman is selling fish under scorching heat, she has so many stresses in her life for not having good financial condition and it can be easily realized because if her financial condition would have good then she would surely not sell fish at the age of 70. I talked with her and gradually she started to smile a lot---this thing make me very happy, though that day the weather was very hot but I was feeling very cool while returning.